Every magnet has a north pole and a south pole. The opposite poles of the different magnets attract each other, while the same poles of the different magnets repel each other. It is not possible to have a magnet with a single pole. Flat-Earthers proclaim that Earth cannot be a sphere because if a compass really points to the north pole, then on the equator, it should point 45° downward. They are wrong. A magnet does not only have the north pole, but it also has the south pole which is attracted to the north pole of Earth’s magnetic field. Near the equator, both forces are balanced and pull the compass’ needle to both Earth’s poles at the same time. A perfectly balanced compass will be level near the equator. All magnets have two poles. Breaking a bar magnet in the center will result in two bar magnets with two poles each. A compass needle also has two poles. Its north pole is attracted to the south pole of Earth’s magnetic field and vice versa. Important: A magnet’s North pole is defined as the pole that is attracted by the Earth’s North Magnetic Pole when the magnet is suspended so it can turn freely. Since opposite poles attract, the North Magnetic Pole of the Earth is really the south pole of its magnetic field. In addition to the force of attraction, there is also the force of repulsion. The north pole of a compass is repulsed by the north pole of Earth’s magnetic field and vice versa. Near the equator, all the forces have the same magnitude, and a compass will be level. Flat-Earthers claim that only on a flat Earth, a compass needle will point to the North Pole. 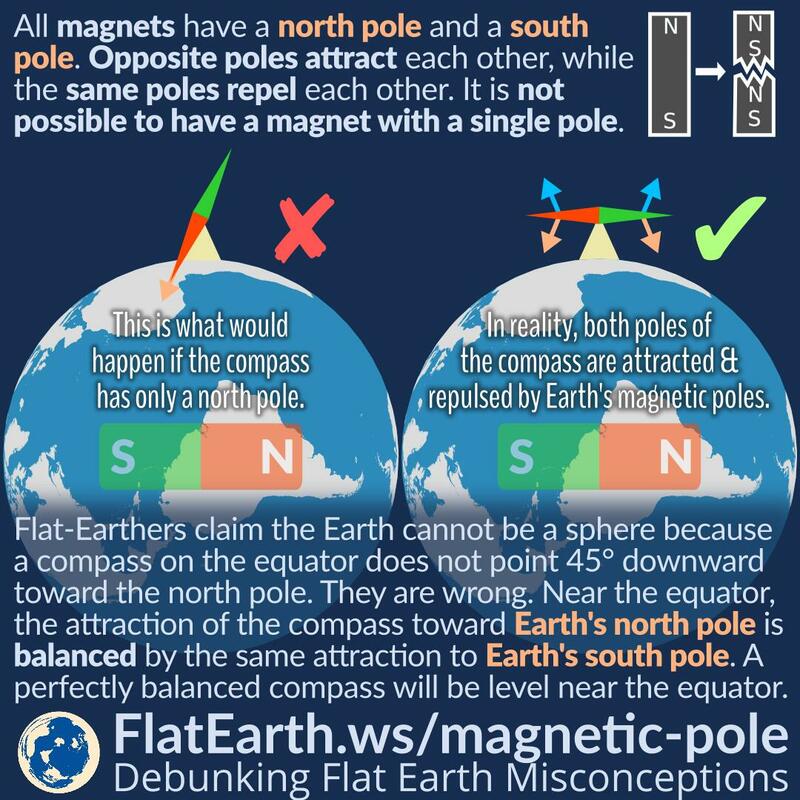 They ‘forgot’ to account for the fact that the south pole of the magnet is also affected by Earth’s magnetic field in the same way, making the compass level near the equator. Additionally, at a location far enough from the equator, the phenomenon of magnetic dip will be more pronounced. A compass will need to be specifically designed to be used in such locations. Otherwise, the needle will bind and will not give us the correct results. This phenomenon is obviously not compatible with what is claimed by flat-Earthers: a balanced compass does not point to the north pole. The same excuse they are using to ‘disprove’ spherical Earth also applies to them.